One day I was discussing the Hindu-Muslim problem with Gurudev Rabindranath. Gurudev said: Look, you can cut the tail that’s on the outside, but who can cut the tail that’s inside? Whenever the topic of Hindus and Muslims comes up I am always reminded of what Gurudev said. At the same time, the question also presents itself as to how this tail came about? What is its origin? And I also think, whoever grows this tail — inside or outside — becomes an animal. But we should not be that scared of those animals with tails whose ferocity comes out in the open in a simple way – in the form of horns; the really scary ones are the beasts whose ferocity remains on the inside, without the benefit of any horns on their heads. Hornless animals like tigers and bears are much more ferocious and dangerous than horned beasts like cows or buffaloes. In this respect man also falls into the category of hornless tigers and bears. But at least tigers and bears have tails on the outside, and that is their saving grace. Because one cannot understand how ferocious an animal can become if it lacks both horns and tails if one hasn’t witnessed the stabbings and killings of Hindus and Muslims. But the question I asked was, where does this internal tail come from? I think it originates in pigtails (tikis) and beards (daris). Its original birthplace is tikistan and daripur. What a primordial desire man has to dress up as beasts. And because he couldn’t grow either a tail or horns he settled for pigtails and beards. What celebration it must have caused in the beastly realm of the human mind the day he realized that one could make up with pigtail-beard what one lacked in terms of tails. In this way, man’s eternal kinship was turned into an adversarial relationship by erecting one wall after another. One can tolerate the truths of religion, but throughout the ages, the intolerable nature of doctrine has led man to rebellion against it again and again. Hinduism-Muslimism are both tolerable but what is not tolerable are their pigtailism and beardism. Those two are the culprits that are at the root of all the fighting. Pigtailism is not Hinduism, it is panditya (scholasticism). Similarly, beardism is not Islam, it is mullahism. These two -ism brands of locks of hair are the root cause of so many hair-pulling fights. The fight that we see today is the fight between panditya and mullahism, not a fight between Hindusim and Islam. Narayan’s mace (gada) and Allah’s scimitar will never go into a fight with each other because they are in reality the same, a weapon held by one hand will not fall on another weapon held by his other hand. He, who is all names, all names have dissolved unto him. In the midst of all this fighting, the only consolation is that Allah, who is also called Narayan, is neither Hindu nor Muslim. He has neither pigtail nor beard. He is completely “clean”. What I despise about pigtails and beards is that they remind humans that you and I are different. The outward symbols make men forget his eternal blood-ties. None of the avatars or prophets ever said, we have come for Hindus, we have come for Muslims — or, we have come for Christians. They said, we have come for humanity — the way light comes for all. But the disciples of Krishna say, Krishna is for Hindus, Muhammad’s followers say that he is for Muslims, Christ’s followers say that he is for Christians. Kishna-Muhammad-Christ have become national properties! And all the trouble has to do with property disputes. Men never fight over light, the way they fight over cows or goats. I still remember, when we were children we used to fight over the sun. One would say the sun in our neighbourhood is bigger than the sun in yours. It was our deep-seated belief that a different sun rose in different neighbourhoods. The fight about god is also of that nature. One is saying, Allah is ours, others are saying, Hari is ours. As if god is like cows and goats. And the responsibility for adjudication has fallen on the shoulders of Sir Abdur Rahim, or Pandit Madanmohan Malabya etc. And to see the result of their judgement one only needs to go to the nearest medical college hospital. But what do we see today? When Khairu Mia falls down after getting stabbed and Halim comes to his rescue, the Hindus of civil society cry out, “What are you doing, mister? You are saving a Muslim! Let him die!” The Hindus having failed to recognize Halim as a Muslim as he couldn’t grow a beard, whereas Khairu Mia was bearded. When, stabbed, Bhujal Singh fell upon the road and Shashadhar Babu, with a Turkish-cut beard, came to his rescue, he met the same kind of treatment. Men have turned into beasts forgetting their eternal blood-ties. The beast’s tail is growing all over his head and his face. They are killing lungis and murdering dhutis; They are killing pigtails and beards! Will there be no end to the killings by these ignoramuses that revolve around external symbols! Will man be so blind that Suniti Babu will become the secretary of Hindu society and Mujibor Rahman Sahib will become the president of Tanjim Tablik? Walking down the road I passed a bull which has shed its tail. At the same time, I saw my generous friend, recently returned from England, has grown a tall pigtail on his head. It seems like man is growing tails just as beasts are shedding them. 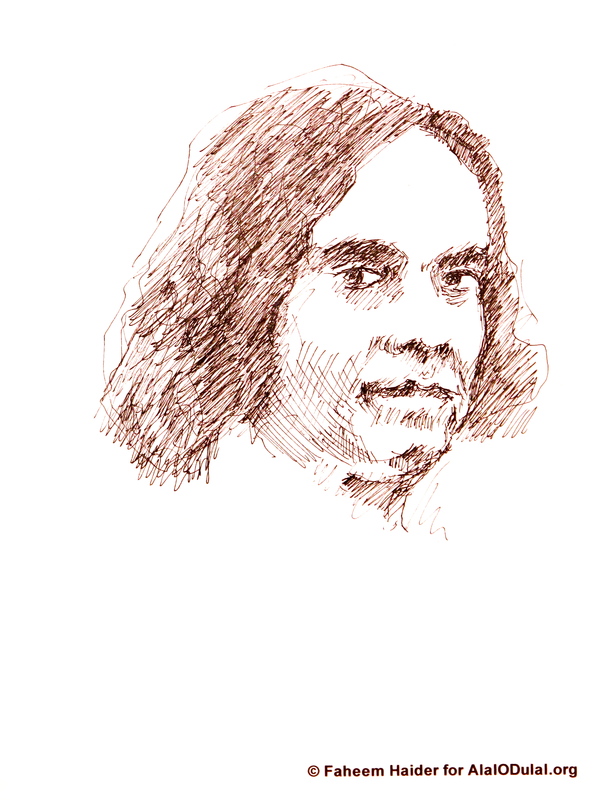 Kazi Nazrul Islam (1899 – 1976) is the national poet of Bangladesh. He is known as the rebel poet and is the author of many works of fiction, poetry, essays and songs. This essay was published on the 2nd of September, 1926 in the “Gonobani” weekly magazine published from Kolkata. Nazrul was a life-long advocate of harmony between the different religious groups of the Indian subcontinent. Editor’s note: Although this essay has been translated into English previously, we felt that it was necessary to remind our readers of Nazrul’s wise words again. Nazrul, in this essay, reveals himself to be a fine thinker in a secular tradition that is inclusive of all religions yet rejects religious fundamentalism. একদিন গুরুদেব রবীন্দ্রনাথের সংগে আলোচনা হচ্ছিল আমার, হিন্দু-মুসলমান সমস্যা নিয়ে। গুরুদেব বললেন: দেখ, যে ন্যাজ বাইরের, তাকে কাটা যায়, কিন্তু ভিতরের ন্যাজকে কাটবে কে? হিন্দু-মুসলমানের কথা উঠলে আমার বারেবারে গুরুদেবের ঐ কথাটাই মনে হয়। সঙ্গে সঙ্গে এ প্রশ্নও উদয় হয় মনে, যে এ ন্যাজ গজালো কি করে? এর আদি উদ্ভব কোথায়? ঐ সঙ্গে এটাও মনে হয়, ন্যাজ যাদের গজায় – তা ভিতরেই হোক আর বাইরেই হোক – তারাই হয়ে ওঠে পশু। যে সব ন্যাজওয়ালা পশুর হিংশ্রতা সরল হয়ে বেরিয়ে আসে বাইরে – শৃঙ্গ রুপে, তাদের তত ভয়ের কারণ নেই, যত ভয় হয় সেই সব পশুদের দেখে – যাদের হিংস্রতা ভিতরে, যাদের শিং মাথা ফুটে বেরোয়নি! অবতার-পয়গম্বর কেউ বলেননি, আমি হিন্দুর জন্য এসেছি, আমি মুসলমানের জন্য এসেছি। তাঁরা বলেছেন, আমরা মানুষের জন্য এসেছি — আলোর মত, সকলের জন্য। কিন্তু কৃষ্ণের ভক্তরা বললে, কৃষ্ণ হিন্দুর, মুহম্মদের ভক্তেরা বললে, মুহম্মদ মুসলমানদের, খ্রীস্টের শিষ্যরা বললে, খ্রীস্ট ক্রীশ্চানদের। কৃষ্ণ-মুহম্মদ-খ্রীস্ট হয়ে উঠলেন জাতীয় সম্পত্তি! আর এই সম্পত্তিত্ব নিয়েই যত বিপত্তি। আলো নিয়ে কখনো ঝগড়া করে না মানুষে, গরু-ছাগল নিয়ে করে। বেশ মনে আছে ছেলেবেলায় আমরা সূর্য নিয়ে ঝগড়া করতাম। এ বলত আমাদের পাড়ায় সূর্য বড়; ও বলতো আমাদের পাড়ায় সূর্য বড়! আমাদের গভীর বিশ্বাস ছিল, প্রত্যেক পাড়ায় আলাদা আলাদা সূর্য ওঠে। স্রষ্টা নিয়েও ঝগড়া চলেছে সেই রকম। এ বলছে আমাদের আল্লা; ও বলছে আমাদের হরি। স্রষ্টা যেন গরু-ছাগল! আর তার বিচারের ভার পড়েছে জাষ্টিস সার আবদুর রহিম, পন্ডিত মদনমোহন মালব্য প্রভৃতির ওপর! আর বিচারের ফল মেডিক্যাল কলেজ গেলেই দেখতে পাওয়া যাবে! কিন্তু আজ দেখচি কি? ছোরা খেয়ে যখন খায়রু মিঞা পড়ল, আর তাকে যখন তুলতে গেল হালিম, তখন ভদ্র সম্প্রদায় হিন্দুরাই ছুটে আসলেন, “মশাই করেন কি? মোচলমানকে তুলছেন! মরুক ব্যাটা!” তারা ‘অজাতশ্মশ্রু’ হালিমকে দেখে চিনতে পারেনি যে সে মুসলমান। খায়রু মিঞার দাড়ি ছিল। ছোরা খেয়ে যখন ভুজালি সিং পড়ল পথের উপর তাকে তুলতে গিয়ে তুর্কীছাট-দাড়ি শশধর বাবুরও ঐ অবস্থা! মানুষ কি এমনি অন্ধ হবে যে, সুনীতিবাবু হ’য়ে উঠবেন হিন্দুসভার সেক্রেটারী এবং মুজিবর রহমান সাহেব হবে তঞ্জিম তবৄলিগের প্রেসিডেন্ট?